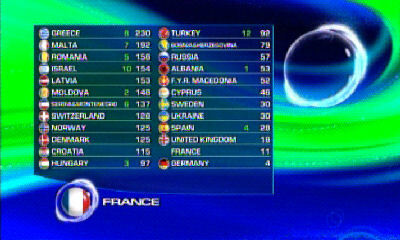 For all those people who are interested in the Eurovision Song Contest, here are the results for 2005. The 2005 Eurovision Song Contest was held at the Sports Palace (Palats Sportu), Kiev, Ukraine. Presenters were Masha (Maria) Efrosinina and Pavlo Shylko, (DJ Pasha). This is the second Eurovision Song Contest to have a semi final and a final. The semi final was broadcast on Thursday 19 May 2005, 2 hours 17 minutes long. The final was broadcast on Saturday 21 May 2005, 3 hours 25 minutes long. Romania won the semi finals, Moldova finished in 2nd place, Denmark in 3rd place. Please click here for full 2005 details! (Pre Eurovision Night). This detail pages was this page until 21 May 2005. The winner was Greece. Romania won the semi finals. For Background Details to the 2005 Eurovision Song Contest, please click here. Here are the predictions (by me) regarding the varies of Countries for 2006 contest (before anything else is known). Unconfirmed, the date for the Eurovision Song Contest 51st Contest Semi Final 2006 is Thursday 18 May 2006 and the Final is on Saturday 20 May 2006. Prediction made on Saturday 21 May 2005 11:30pm.